Heavy-duty 304 stainless steel frame construction for strength and durability with a bead blasted finish. Sanitary design features wash down construction to prevent accumulation of materials. No tube penetration design with all pneumatic tubing, conduit, and electrical enclosures mounted on welded stand-offs to allow clearance for cleaning. MTS exclusive column shrouding package with white vinyl coated nylon cover. 316 stainless steel telescopic rigid material inlet tube. 3” diameter dust take-off with actuated butterfly valve vents displaced air during filling cycle. Bag inflation system includes air amplifier and actuated butterfly valve for maximum fill volume. 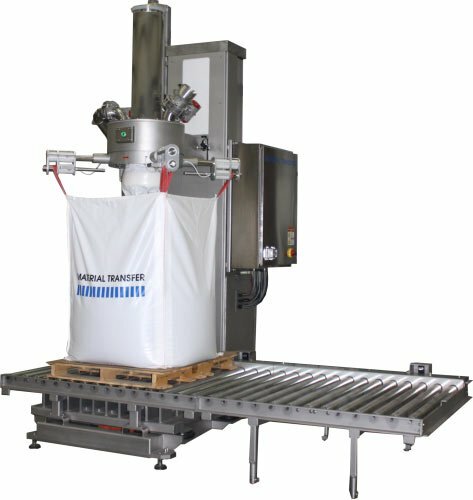 Hydraulic Power-Lift™ system with VFD automatically positions fill head for ergonomic bag connection of various size bulk bags. Inflatable spout seal is actuated by a push button switch conveniently located near the fill head. Unit includes a powered chain driven roller conveyor system with end stop. Unit features a heavy-duty, high output, “pop up” densification system with VFD to settle material during and after fill cycle. NEMA 4X panel with Allen-Bradley CompactLogix. Remote Allen-Bradley PanelView Plus 1000 operator interface provides easy access to system status, recipes, and operational parameters (not shown).